Color brigtens any day, any room. We have a huge selection of colorful wood frames from simple to fancy. 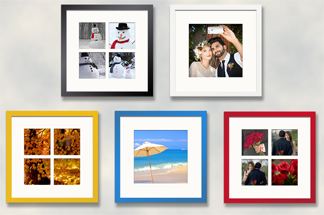 The simple "cube" frames shown below are perfect for contemporary works of art or for dressing up family snap shots. We use them for our 12x12 "social media" frame packages at The Framer's Outlet.